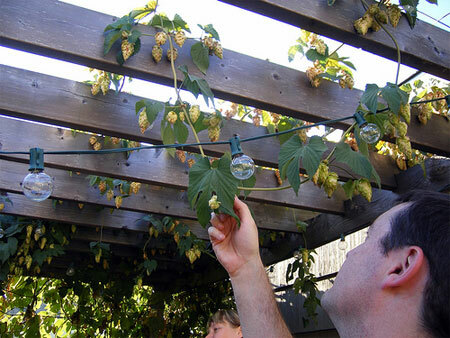 As the days get shorter and the hop cones start to weigh down your vines, it’s time to plan your fresh hop homebrew. A few tips from the woefully ill-informed and hungover. Just to set the scene: We met over at Dave’s, since he has the most mature vines. 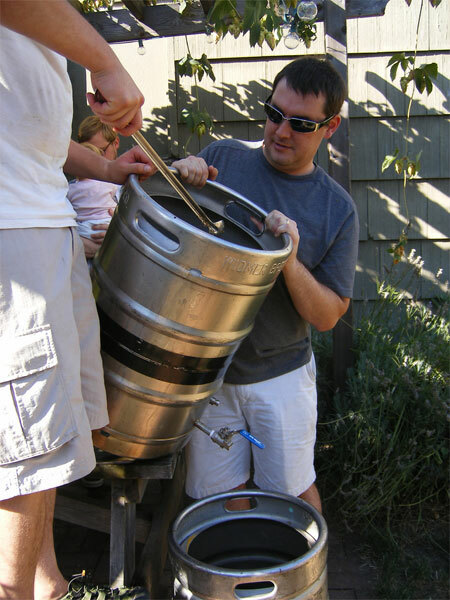 We also made the second voyage of the converted-keg, all-grain homebrew set up. The false-bottomed all-grain was our brilliant downfall. Tip 1: Bag the fresh hops. Unless you have some brilliant method for avoiding the stuck run-off, (Yes, we had a false bottom. Yes, we tried stirring.) the fresh cones come apart and clog your drain. We ended up pouring it out of the top of the keg into the carboy, which was pretty lame, messy, and probably unsanitary. 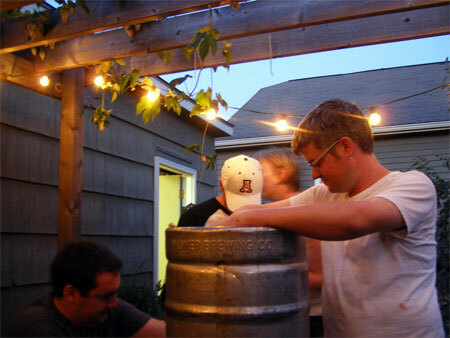 If you DO know how to let the cones swim free in the false-bottom keg conversion without causing a clog, please leave us a comment below. Seriously. Tip 2: Pace your drinking anytime you’re brewing all-grain. Extract brewing takes what? Two hours? With all-grain, you could be out there six hours or so. Mix in some highly potent homebrew and archive beers, and when those hops get stuck, you’ll be in no frame of mind to figure a smart solution. Tip 3: Don’t plan anything for the next morning. I think this tip comes from Dave. Tip 4: Don’t talk politics, especially at the end of the night. Tip 6: Do be very, very afraid of the intestinal aftermath of combining lots of homebrew, BBQ bacon, BLTs, bacon burgers, bacon brittle, bacon cookies, and canned bacon. Be prepared to sleep on the couch. 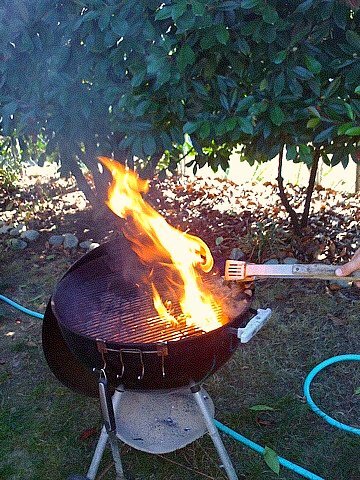 Tip 7: Do not use homebrew to put out a BBQ bacon grease fire. Tip 8: Use the mostly green hops. The scent was not as hoppy as I would’ve expected considering we picked and dropped fresh hops into the boil for nearly the full hour. What type of hops were they? If you know how to identify hops, please call us. Operators are standing by. In all, another great day in Dave’s backyard. I believe the girls from FU Cheese even made a cheese press in Dave’s woodshop, but that tale will have to wait for another day. It’s kind of hard to believe it’s all over. We’ve spent the last 7 days of celebrating (and savoring) the candy of meats: we tried bacon candy, chocolate-covered bacon, bacon mints, and bacon-flavored jelly beans. It wasn’t all sweet: fake bacon turns out to be a horrible, horrible invention, and we must be missing something when it comes to the bacon bra. Bacon doughnuts were universally well-liked, as were bacon bandages, but I think the “bacon beer“, bacon wallet and bacon air freshener could go either way. Canned bacon was the big surprise winner; I think everyone thought it would be horrible, but it was surprisingly tasty, as was the Baconator (for a fast food burger, anyway). Bacon salt testing was a bit inconclusive. It was delicious on bland Russian dumplings, but too much for the subtle beauty of stovetop popcorn. We had a few celebrities drop by: Sara Perry, author of the Everything Tastes Better with Bacon cookbook did an e-mail interview, as did the National Pork Board. At our house, bacon is more than just a main dish for Sunday breakfast … it’s a condiment, a flavor enhancer, a cooking partner, and yes, a way of life. Fact is, there are few food situations that aren’t improved by the addition of bacon. Salads become treasure hunts with a little bacon. Burgers are really only complete when topped with a couple slices of salty goodness. And, as we’ve seen this week, sometimes even dessert is better with bacon. 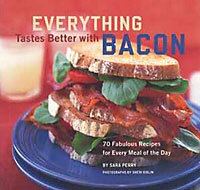 Author Sara Perry took this belief to the extreme in 2002 when she authored one of my favorite cookbooks, the truthfully-titled Everything Tastes Better With Bacon . Inside its pages, Perry has created some unbelievable recipes that feature bacon as a central ingredient, but also as a savory flavor enhancer in a supporting role. There’s a fantastic meatloaf recipe (drape 3 slices of par-cooked bacon over the loaf while it bakes), a great halibut dish where the fish is cooked in parchment paper, and my personal favorite, Sizzling Herb Pasta with White Beans and Crisp Smoked Bacon. 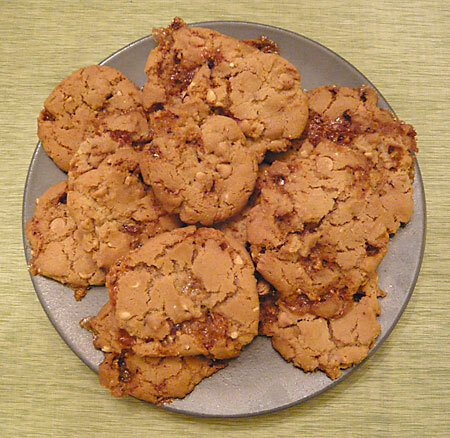 This week, I tried two new recipes from the book that further reinforced my admiration for Sara Perry, one for Try-It-You’ll-Like-It Bacon Brittle (above), and another for Double-Crunch Peanut Butter Cookies (below) that actually used pieces of bacon brittle inside, in addition to a healthy dose of crunchy peanut butter. Both turned out fabulously, and well-balanced. There’s a bit of bacon present in both, but not in a starring role. Through the magic of the internet, I was able to reach out to Sara, and she was kind enough to participate in an e-mail interview about bacon, cookbooks and bacon cookbooks, included below. The Champagne of Blogs: Tea , Coffee , Cakes , Kids … BACON. One of these things is not like the other … How did you decide to do the bacon cookbook? Sara Perry: Hmmm, which one? They’re all my guilty pleasures! The decision was easy … my Chronicle editor made me an offer I couldn’t refuse. Truth be told: Bill LeBlond called me one day and asked if I was sitting down. “I have an idea for a book, but I know it’s going to sound odd.” So, when he told me bacon, I agreed. “Think about it,” he says. “Doesn’t everything taste better with bacon?” Could I argue? He’d been having lunch with a chef in San Francisco and the topic came up and the idea was born. I agreed, and since I LOVE bacon, I thought it would be a kick, but the only problem was a dessert chapter. “Oh, you’ll think of something,” said Bill. It took awhile, but I immediately went back to my favorite sweet, porky taste . . . .the covering of a Honey Baked Ham. 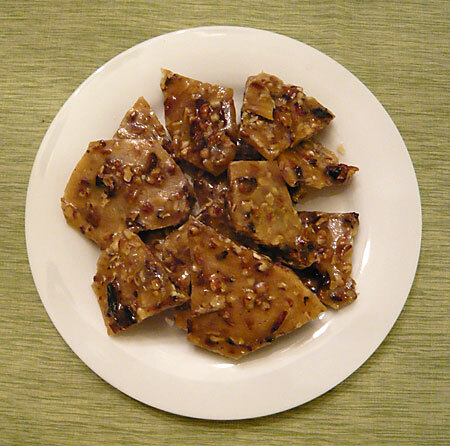 That brown sugary, salty, crunchy flavor was so adaptable and a chapter was born. TCOB: Preparing the book, I’m sure you’ve sampled quite a few. What’s your favorite bacon? SP: Good question. I go back to guilty pleasures here. Do you have any? Like, for instance, chocolate. Sure I love the very best, but put a cheap, chocolate-coated malted milk ball in front of me and I’ll jump you for it! So, as long as the bacon is meaty … good ratio of meat to fat; is fresh and is cooked RIGHT, I’ll snag it. When I was testing for the book, I enjoyed each and every sample I tried. I know there’s criticism out there about Neuske’s applewood bacon being too smoky (or something), but I really enjoy it. Believe it or not, Hormel makes an excellent thick-sliced bacon, but it’s only available to professional chefs. The guy at The Grateful Palate has a Bacon on the Month club that has lots of tasty delicious choices. OH WAIT. There is one kind of bacon I do not like. Period. That’s the ready to microwave bacon. One word for it: Cardboard facsimile with flavors imported straight from the New Jersey “aromatic” distilleries (not really, but it seems that way to me). TCOB: What’s the weirdest bacon-related thing you’ve ever seen? TCOB: Why do you think bacon has achieved such notoriety/infamy? What has it got that ham/prosciutto/jerky doesn’t? SP: I go back to my book for this one: I think bacon did have a career slump, but now it’s entering it’s renaissance and it’s about time. Previously disgraced as a fat, preservative-laden meat, bacon now offers many healthier options. It’s learner; it’s tastier; and you can find it free of chemicals. Artisan-style farms are raising pigs without hormones or antibiotics and they’re producing natural organic bacons that satisfy an appetite for old-fashioned flavor. Cooks have always known hat bacon adds shadowy richness, earthy fragrance and subtle nuance to elegant entrees and everyday comfort food. That’s because bacon has two humble but charismatic ingredients: salt and fat. Salt brings out the flavor and fat carries the flavor to our taste buds. BUT not only that: Bacon has bite! It’s chewy and crunch. Savory. Slightly sweet, and damn habit-forming. To answer the second half of the question. It has a name. A familiarity to every American kid who ever woke up to the smell of it cooking in the skillet. TCOB: Ever tried making your own bacon? SP: When I wrote my first book, “The Complete Coffee Book, I tried roasting my own coffee. Over and over again. Never was very good at it, but I learned a valuable lesson. Leave it to the folks who have a passion for creating the food we love to eat. That goes for bacon too! Okay, so what’s the best way to cook bacon???? SLOWLY. For crisp, as-you-like-it bacon, nothing beats cooking it in a cold cast-iron skillet. It’s also the best way to enjoy the delicious aroma? (Recall your first memory of bacon?) Mine is that rise-and-shine smell of weekend bacon on the stove. Bottom line: With a top-quality bacon, use a cold, heavy skillet; it’s the only way. In a skillet large enough to hold the slices in a single layer, arrange the slices and cook over medium-low heat. Doest that seem too low? Are you used to hot bacon fat spitting a you? No more. Cooking bacon at a low temperature prevents shrinking, curling, and uneven cooking. It’s time to say “so long” to roller-coaster bacon blackened on the crest and barely cooking on the downhill. ONE LAST SERMON: Whether you enjoy it by the pound or parcel it out by the slice, you probably think it’s really fattening. Here’s the skinny: One uncooked, meat-streaked bacon slice (a little less than an ounce) has 126 calories and 24% fat. Obviously, a lot of fat melts AWAY during cooking. That same piece COOKED has 36 calories and about 6% fat. Pretty good, huh? Sure, the values change depending on the leanness of your bacon and remember, if you use uncooked bacon in a stew or other dish, the fat has not been removed in the cooking process. CHEERS! TCOB: Thanks, Sara. Bacon rocks, and so do you! My friend and co-worker, Marci (aka Marci the Vegan Marathonner) bought me some bacon-themed gifts a few months ago, which was at least part of the inspiration for this week of bacon and bacon-related products. One of these products was a bacon air freshener. For cars. But as I write this, I wonder … wouldn’t an aerosol spray version be amazing? 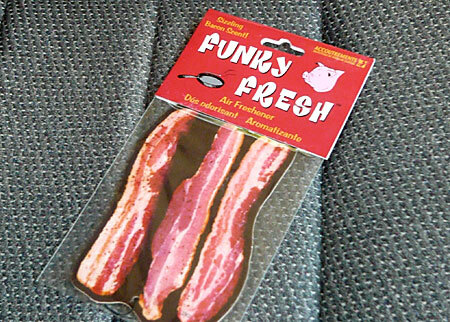 Screw Febreeze with their “fresh” scent – when someone stinks up the bathroom at work, we could cover it up with a delicious bacon scent. The smell of fresh-cooked bacon, wherever you want it. Spray it in the kitchen in the morning, and make everyone in your house think there was a bacon breakfast coming … such a cruel, cruel trick. The psychological power you’d wield … But I digress. I think like a lot of bacon products, the packaging may be the best part of this product. The multi-lingual label is great in its optimism: as if anyone other than an American would be silly enough to buy this product. Although, the Europeans do appear to support not one, but TWO brands of bacon-flavored potato chips, so I could be wrong. 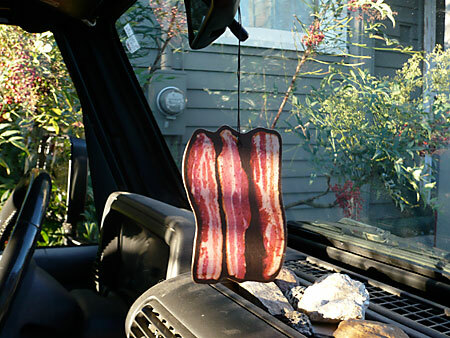 As air fresheners go, this is a well-made one, with nice, photo-quality bacon. It just looks good hanging in your car. How does it smell? Not very bacon-y, to be honest. It’s got a savory smell to it, for sure, though I would call it generically meat-scented, and not anything I’d call specifically bacon-smelling. It has just a hint of smoke, but it does provoke a hunger response. Driving to work one day last week, I got some hunger pangs when I got in my car at the end of the day, but I wasn’t craving bacon (any more than I usually do, which is pretty often) in particular. 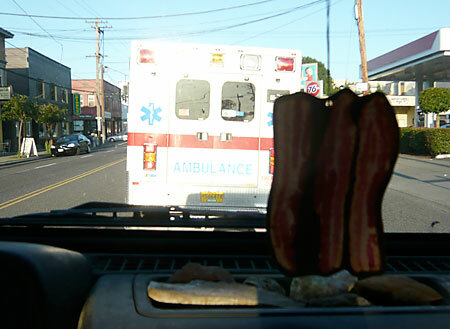 I did have a funny experience driving TO work, though … As I pulled onto Glisan, I noticed I was directly behind an ambulance. I think they should have been following me, though!